The Adjacent Possible, Part 2 – Love. Life. Practice. When we last left our intrepid idea of life, things were looking a bit bleak. We had realized that social media and our “always-on” society had given us a constant supply of variable rewards – which I termed the “Gravy Hose.” That tasty gravy gives us constant stimulus, not only little dopamine jolts of connection but also a stream of ideas, the ten best ways to the three simple steps to the most important key to overnight unlimited successful income. We have to pay attention, right? Because if we don’t, we’ll miss something. It’s true. I missed my daughter’s near-death, in fact, just the other day. But I’ll tell you about that on Friday, when we talk about the bandwidth of love. Instead, let’s talk about how to make the Adjacent Possible our greatest ally. 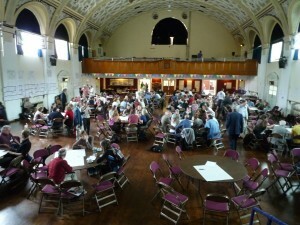 An Example of an Open Space workshop. Mindful of the Klingon maxim of all paths leading to victory, I proceeded to stack the deck. I hand-picked the participants, sending out about 30 invitations to friends and colleagues in the area. I knew these people well; I knew that they liked each other, and were interesting people in their own right. If the Unconference structure didn’t work out, then I was confident they would have a helluva party. More than that, at that time I was a pretty prolific presenter in the realm of independent performance and movement arts, so I knew that even if they did just decide to sit around, I had enough classes under my belt that I could instantly propose a day-long symposium on my various specialties and make it a success. So I had three possible outcomes, two of which were contingency plans in case the ultimate goal didn’t work out. As it happened, the Unconference was a smashing success, and it opened up an adjacent possibility that I’m still riding around the world five years later. My adjacent possibles weren’t the only ones affected: two people who met at that Unconfeence went on to have a romantic relationship for several years, and more than a few have since become presenters and educators in their own rights. This was not an accident. Neither was any of it planned. Rather, it was a case of the right mixture of elements coming together in the right place at the right time to form new things. Those of you who follow my twitter (and yes, I’m aware of the irony of that statement) may have seen my link to the Atlantic Monthly article about social-media rants. Particularly, Roger Cohen of the Times had been called to task for being “not-even delightfully cranky” in his condemnation of social-media sharing. Alexis Madrigal wrote that it was unfair to criticize people who posted inane, negative, or annoying posts to your feed because, after all, it’s your feed. No one is forcing you to read about celebrities. No one is forcing you to read about diets. No one is forcing you to read about how to be more productive, or what Christian Bale said on the set of the Batman movie. You choose the gravy that fills your hose, in fact, and there is a very good reason to be picky about it. It’s possible to shape the adjacent possibilities of social media by curating the things we choose to listen to. Try it out; look at your facebook or twitter or tumblr and look at the last twenty items. If any of them are not positively affecting you, try unfollowing them. It doesn’t have to be permanent; you can always follow them again if you miss them that much. But more to the point: what are you putting out there? Statistics I’ve just made up show that one out of every three tweeters are actually needlessly whining and contributing more noise than signal to the conversational gestalt. If the tweeters before and after you were interesting and relevant, guess what? That’s right; there are times when the “retweet” button or that particular meme you’re sharing are the equivalent of throwing your garbage in the street. After all, Twitter rhymes with litter. Coincidence? I think not. Now, we can’t all be BrainPickings (though frankly I strive to be) and constantly be a stream of inspiration and intelligence. We’re entitled to the random pun and the funny joke and the occasional sense of personal accomplishment or plea for pity. I work at home mostly alone, so for me social media can act as a virtual water cooler, where you share remarks and stories with co-workers. But nobody gets paid for spending their whole day at the water cooler, and most people will tend to avoid you if you are either an incessant conversationalist or simply a consistent complainer. It’s a simple vetting process, of two parts: do I really need to say this, and do people really want to hear it? If the answer to either one is “no”, then perhaps rethink your status update. Or rethink your entire strategy, an example of which will be coming on Monday. Meanwhile, take a look at what adjacent possibilities you’ve been encouraging with your intake of social media. Are they the ones you want? If not, what are you prepared to do about that?